First of all, thank you to everyone who responded well to last week’s Father’s Day piece. It meant a lot to me to read all the positive feedback. So here we are, the last Core Set until the next time that Wizards rearranges things. It’s hard to believe, but it was 2009 that we were given Magic 2010, which was aligned with Zendikar, widely considered the one-two punch that brought Magic its current ridiculous and so far sustained growth. In a way, I’m sad. Core sets became a fun combination of the old and the new. Mechanics could be expanded on without needing a whole block (bloodthirst!) and certain cards could be proven as amazing in a variety of strategies, perhaps most notably Tormented Soul as an enabler for exalted decks one year and bloodthirst the next. We also missed out on being able to call a set “M16” and that’s just a missed opportunity for unamusing mixups with people who have no idea what’s being discussed. This week, though, I want to focus on the five origin-story planeswalkers, and see where they will end up. First of all, Tibalt set a very low bar for two-mana planeswalkers. 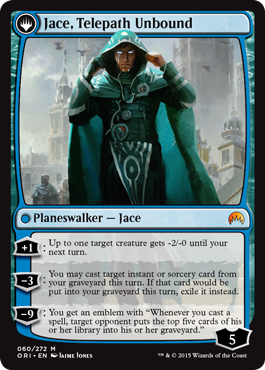 Jace, as a looter, is already better than Tibalt and pretty good as looters go. It’s only two mana, which cannot be overstated. It’s cheap and easy at 1U. The synergy of his abilities, and his loyalty, is what’s impressive. I do not find it hard to believe that Jace can be flipped on his first activation, what with cards like Thought Scour, fetchlands, and Satyr Wayfinder around. His loyalty is also an impressive five to start, but if you’re only filling your graveyard with Jace’s effect, five loyalty on turn seven is a lot less noteworthy. I also really like how planeswalkers are getting “Until your next turn…” abilities as opposed to “Until end of turn…” because it highlights the difference in power of planeswalkers vs. creatures. Saltfield Recluse is a surprisingly hard card to play around in combat, and Jace’s plus ability is on a par with that, even with the lack of instant-speed interaction. 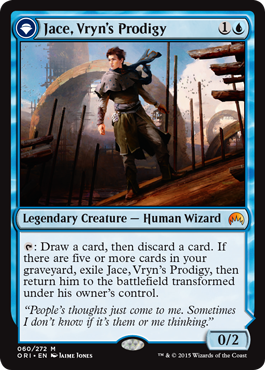 I see this sixth version of Jace as an easy fit into most Cubes, and lots of EDH decks. I would be surprised if he was more than a niche player in Standard, but I wouldn’t rule out free re-use of spells in the graveyard in Eternal. Unlikely, yes, but I can see him as a ‘fun-of’ in some Delver decks. His price will probably not go below $10. Oh, Savannah Lions. You were once a rare, and no upside was needed. Now, there’s no shortage of 2/1 creatures with abilities for one mana, and your time has passed. KG here is going to go right into every Cube with an aggressive white deck. He’s surprisingly tricky to flip, as he needs the right combination of attackers into blockers or open mana for his activated ability. Once flipped, though, he plays merry hell with your opponent’s plans. He’s got two plus abilities, the first of which unfondly reminds me of the first time he was printed. Also, here’s our second “Until your next turn…” ability and it’s a bit tricky. Using this before combat doesn’t grant vigilance, using it afterwards means you have a creature that can live through combat…so you’re likely winning anyway. KG (I hope this nickname sticks!) is going into Cubes, as I said. 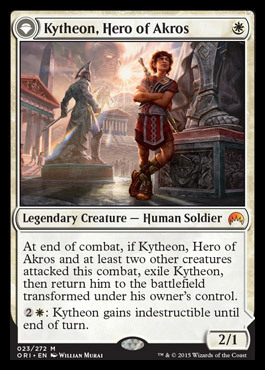 His +1 is going to be sneaky-relevant in Commander too, and there will be no shortage of him at kitchen tables everywhere. I think his price matches that of Jace. This is a stunning, stunning design. I think Chandra is easily the most Constructed-playable of these five and she is a must-kill threat in Standard. I would be a little surprised to see her in Modern or Legacy burn, but the potential is there. It is not hard, at all, to imagine her played on three and flipping on turn four. When she’s flipped, she will have dealt three and add two more if you desire. Any red spell triggers her, not just instants or sorceries. 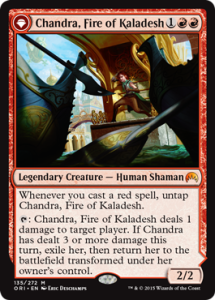 Cards like Gelectrode, Cinder Pyromancer, or Lobber Crew have always had potential to add damage to spells, but Chandra V is a level beyond that. She also jumps right into Cubes as a worthy addition to Burn archetypes and while her first two abilities aren’t going to be relevant in Commander, her ultimate hits everyone hard and must be respected. I do not see Chandra at less than $20 for her lifespan in Standard. If she starts seeing Legacy or Modern play, she could be twice that. This fourth iteration of Liliana is not as overtly powerful as any of her previous versions. Notably, she’s missing any way of killing creatures, though her transformation gives you an immediate blocker. She could flip the turn she enters play, and that’s powerful in and of itself. I can’t find a creature right now that sacrifices for value, like Cartel Aristocrat, but the potential is there. Her abilities are nicely synergistic, but that emblem is amazing and a half. The emblem is going to be what decks are striving for in casual settings, and rightfully so. She’s preordering for around $20, and that’s likely a bit high. Her flip condition is easy to meet and her abilities are worth protecting, so I’d expect to see her around $15. 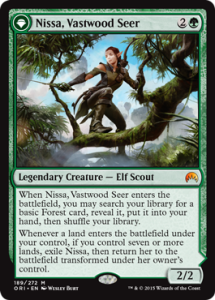 I love this version of Nissa, but that’s not the same as saying she’s very good. 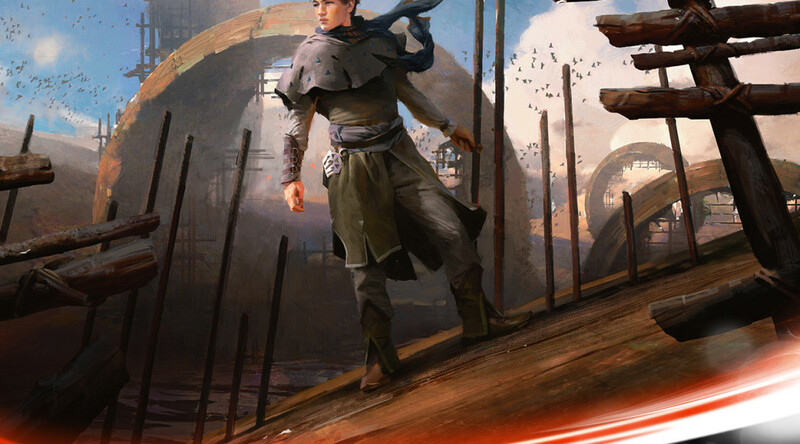 This is the flip planeswalker that seems expressly designed for Commander, because she’s only good with lots of land. It’s very easy to generate seven mana, but having seven land is not what Constructed decks are designed to do. Let’s be clear: Coiling Oracle every turn is not among the most broken things to do in Commander. It’s a good thing to be doing, but the emblem and the legendary token are much less exciting. 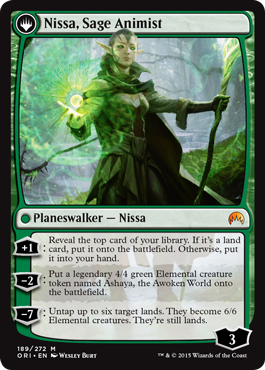 I am going to enjoy playing with Nissa, but Elemental Bond is going to draw players far more cards than Nissa will. I believe that this will be the cheapest of the five, and not see much play outside of Commander. She’s not overtly powerful enough for most Cubes, as a 2/2 that finds you basic Forest is very meh. Remember, the land goes to your hand, not into play. Basics only, and not even directly into play. Her price will reflect her lack of power: She’ll be under $10 by Halloween, and I suspect she’ll be nearly $5 by her rotation time. I’m treating the two unofficially spoiled ones (Jace and Nissa) as the truth, and if they aren’t the real deal, I accept the mistake. Also, if these five are indeed the SDCC promos, that puts a larger number of them out there for the collectors and the magpies who need special shiny versions of cards for Cubes and EDH. (I’m one of them!) Don’t overlook the value of having the SDCC versions out there, putting a cap on the individual foil prices. Well KG it is then, lol, good one! I like Chandra’s normal side way more in a burn deck, as she can do 2 damage each turn (also on opponent’s!!) which is a serious clock to consider between other burn-spells. You could say, she adds an extra 2 points of damage to every spell (yes, you need to play two spells on your turn to keep her untapped for the opponent’s turn, but still). As a Walker she only does 2 on your turn and that’s it. Half as efficient. I can’t quite agree on Jace, either. A price tag of 20 $ seems high for someone worse than his cousins (including Baby-Jace and Architect of Thought), even though he is “cheaper”. Liliana’s first two abilities have a nice synergy, but that’s it for me. I rarely see ultimates being activated and I don’t really count them in when evaluating. 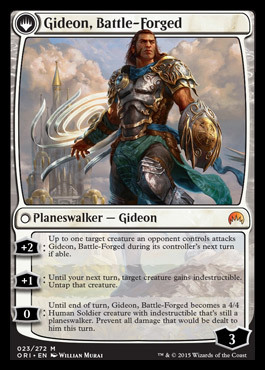 KG seems very good and I have the impression, WotC try to push White Weeny back to competitive play. Nissa has no appeal to me whatsoever. Um, I’d cut those prices in about half… maybe in 1/3rd. I can’t see them seeing a whole lot of play to be honest. But something’s got to eat up the EV of the set somehow, and I haven’t seen a whole heck of a lot in Origins to do that just yet, so maybe they do see $10+ price tags. Chandra I think is the only one who sees much play. Burn to replace rabblemaster’s 3 slot, even though she’s completely different. Turn 1 swiftspear, Turn 2 do something, I don’t care… Turn 3 Chandra, Turn 4 Tap Chandra to ping their X/1 (or do 1 damage to them) then burn them or their one blocker that could kill Chandra, attack with chandra and flip, do 2 more damage. They have no way to deal with her unless they have a “destroy target planeswalker”. Actually she has to tap to activate, so you’d have to attack, burn their blocker, do combat damage, then tap. Cliff, I’m shocked at your take on Chandra but everyone is entitled to an opinion so can you elaborate on why you think she will be so good?? Another writer on here and even other magic broadcasters and hype men don’t think she is good. I think she is horrible, she is so much work for so little payoff. 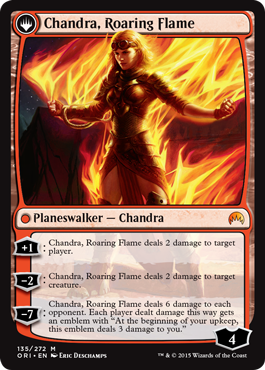 Chandra Pyromaster is immensely better as they are both “turn 4” walkers…except one of them might never be a walker and be stuck as a 2/2. Plus in a red deck do u really want to wait til turn 3 to play a 2/2 and then have 2 spells minimum in hand to flip her on turn 4 (and I say 2 spells cause as a 2/2 she probably needs a lot of help surviving combat come turn 4)?? Regarding Liliana (I just realized I gotta stop posting but I’m trying to stay awake, lol) I’ve been making the Cartel Aristocrat and Viscera Seer + Lili Healer connection since she was spoiled and wonder if she can/will end up in some sort of Collected Company combo deck or as just a value card in Modern Abzan. In Standard I think exploit will help her out nicely. You need to directly kill her, she doesn’t need to do anything in combat like Chandra or require a ton of tricks. You can simply cast a turn 4 Vultuous Aven and sac him to his own exploit trigger. You could also use Profaner of the Dead, Sidisi Undead, etc and just exploit the creature to itself to flip Lili and get a 2/2 zombie (it is also important that this zombie is untapped unlike a lot of tapped 2/2 zombies that sometimes enter the battlefield from other cards). Since you are playing black and tons of removal she might even get in some damage and gain you some life. While I agree with you that Nissa is underwhelming, I think Jace will beat her out for lowest value card with Chandra nipping at their heals. In Standard if Sultai Control becomes a thing, or if Abzan, RG dragons or Temur need to ensure a way to hit land drops Nissa isn’t glamorous but she is splashable, ensures control players hit a land drop, and is a fine chump blocker. 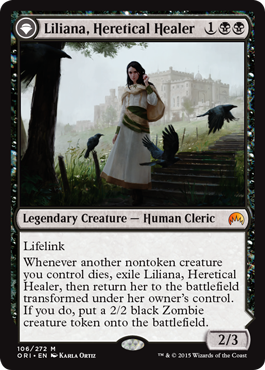 I wouldn’t be shocked (though I’m not betting on it) if she finds some sort of unconventional home in one of these builds to help ramp out creatures once Caryatid, Courser, Wayfinder, and maybe Elvish Mystic rotate out of Standard. Late game she is a solid card (note that the lands/elementals no longer have trample) though outclassed by virtually everything you want to be doing with 7 mana, but she has modest Standard potential cause she’ll rarely be a dead card. I did overlook Lili’s synergy with Exploit, it’s true. I was looking for ways to flip her immediately after she entered play. Modern does indeed offer a lot of value, but I don’t play enough of it to know if she is good enough. As for Chandra, I’m eager to see what goes on with her. A plus ability that pings a player for two is better than almost every plus ability she’s had. It’s true that she needs work but I think the payoff might be there. Or, you know, I’m wrong. Time will tell. Thanks for the response Cliff. Off to Baltimore for me, have a good weekend. Howdy, Well put together publish. It has an problem with your site around traveler, may possibly go here? For instance nonetheless would be the market place key as well as a large component of other folks can miss a person’s amazing producing as a result difficulty.